Diese Woche erschien im Spiegel unter dem Titel „Das kann ich besser“ ein langes „Streitgespräch“ zwischen den beiden Kontrahenten (für Abonnenten hier; frei auf Englisch hier). Aber ehe Sie das Streitgespräch lesen, nehmen Sie doch vielleicht erst einmal an unseren Open Europe Berlin Quiz teil. Sie haben im Mai die Wahl: „Wer kann was besser?“. Das ist auch gut so. Bis dahin müssen Sie aber erst einmal herausfinden: Wer steht wofür? Und heute einmal konkret: „Wer hat es gesagt?“ Alle Antworten im Original aus dem Spiegel-Streitgespräch. Die Auflösung am Schluss. Warum die Antwort selbst auf die letzten beiden Fragen nicht wirklich klar und der Vorgang nicht wirklich normal ist, möchte ich gerne demnächst diskutieren. Und das hat nichts damit zu tun, dass unser Quiz selbst für eingefleischte EU-Kenner vielleicht eine Herausforderung war. Nur die Briten haben damit scheinbar gar nichts zu tun und unterstützen als Labour Martin Schulz explizit nicht und sind als Tories auch nicht mehr Teil der EVP, die sich aber immerhin einer Kampfabstimmung um ihren Spitzenkandidaten gestellt hat. 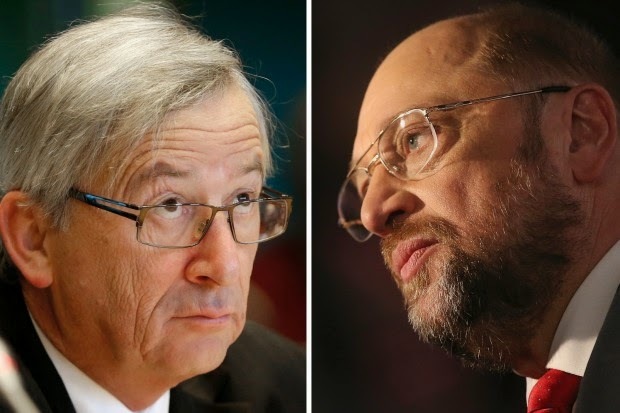 The main issue imho is not so much Schultz or Juncker but imho that all present candicates simply look very unappealing for large groups (probaly a considerable majority) of their traditional voterbase (that of their EP parties). Juncker look to dodgy and comes with alot of bagage. Schultz has a beard and wears brown suits and even worse shoes, need I say more. Not joking the basic impression he gives and that one need to work here as there is no time enough a establish a real relation, is simply awful. Reding is another example and Vanhofstad (or Vanhofwhatever) all simply at an European level totally unappealing. Likely even putting rather people away than attrackt them. Plus seen the electoral views in Europe completely over the top pro-EU on top of that. All also seem not able to properly adress the Euro-sceptism wave we are in. In the contrary they likely will make it worse verywhere else but in their respecive homecountries. Will be very very difficult to get a candidate that is appealing all over Europe. Berlusconi in his prime got a sort of majority in Italy but even at that time would be an absolute no go in the North. Just to give an example. A typical Northerner will do bad down South. East Europeans look maybe with exception of the 2 Poles (the Baltic PM looks sort of ok as well) more or less per definition pretty dodgy in the West. 3 That are not a total push away in the West but also still nothing really special or generally appealing. May be Merkel (I am still pretty doubtful) or Blair in his prime could do the job but non of the current candidates not even close. And also the current leadership Barosso (give an r or an s) and Rompuy seem totally unattractive. Might as well hugely backfire this whole new set up. Tbo honest I find this a more interesting issue than the pesron and views of all the main candidates. And likely via the backfire mechanism a more important one as well. Non of the main candidates seems eevn remotely have the stuff the become a real leader. Either pushing the EU forward or making the reforms long overdue happen. The latter could really become an existential issue in the next term. National electorates when the enough is enough time would there hardly will wait 5 or 10 years until treaties are changed. Aus dem EU-Kosmos betrachtet, finde ich die Ansichten der beiden auch völlig nachvollziehbar. Bleibt die Frage, wie die Lücke zum nationalen Diskurs jemals zu schließen ist, wie die EU-Bürger überhaupt fit werden für diese post-nationale Debatte.